Seen through the pressurized window of an underwater condo, the stark wooden ribs of the 19th-century schooner might be seen reaching up toward the surface of Lake Ontario. To highlight the historic remains, the condo’s board could place lights around the bones of the Sligo so residents could watch salmon schooling at night around the underwater landmark off the western waterfront. The Sligo is one of three visually dramatic wrecks on the bottom of Lake Ontario, close to Toronto’s shoreline. 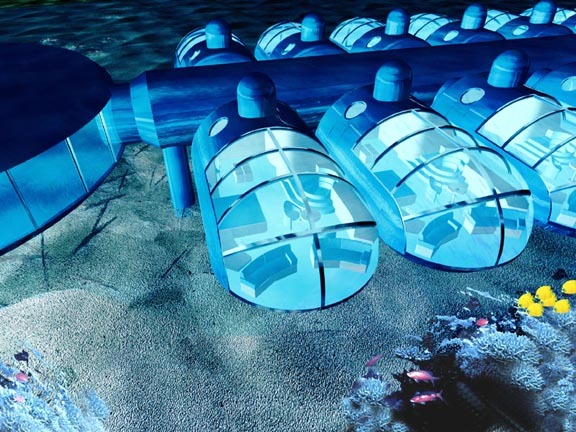 Now visited only by scuba divers, breakthroughs in both building and air cleansing technologies mean multiple dwelling habitats – such as submerged condos – could one day be built within sight of the lake-bottom attractions. Michael Schutte, the vice-president of engineering at U.S. Submarines, doesn’t believe it will take as long as 30 years before people are living on the bottom of Lake Ontario. 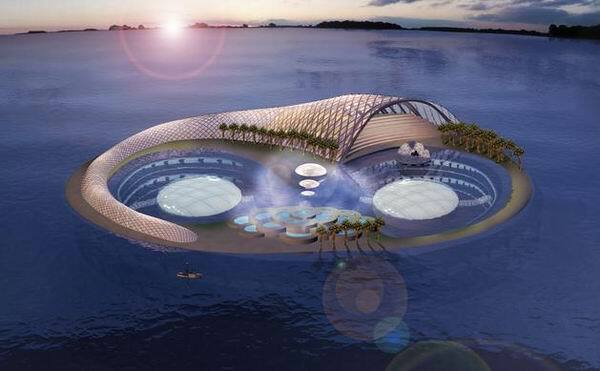 The Toronto-born-and-raised mega-yacht designer is now based in Oregon overseeing the construction of an underwater five-star hotel to open on the edge of a coral cliff in the South Pacific by 2009. 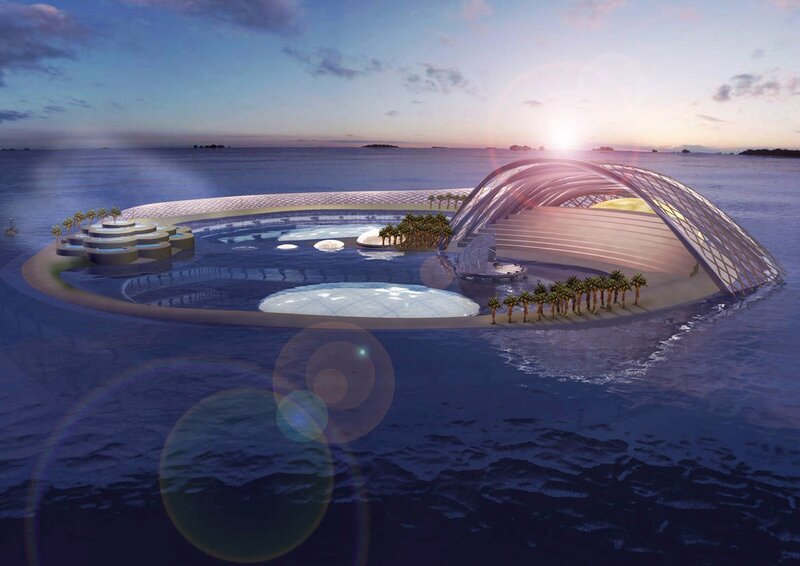 Schutte, 45, is overseeing the above-water construction of the Poseidon Undersea Resort, which will be taken to Fiji and placed on the bottom of a deep lagoon. 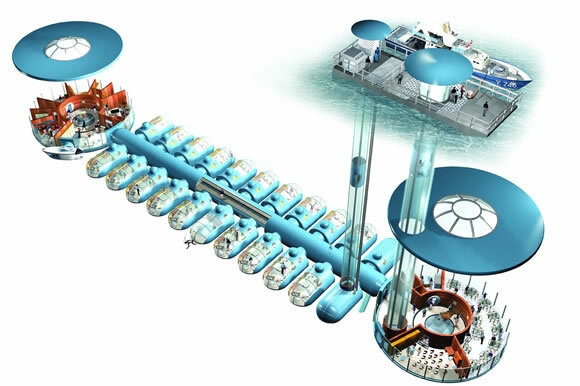 There will be 24 undersea hotel suites and apartments covering 51 square metres, anchored on the ocean floor 12 metres beneath the surface. 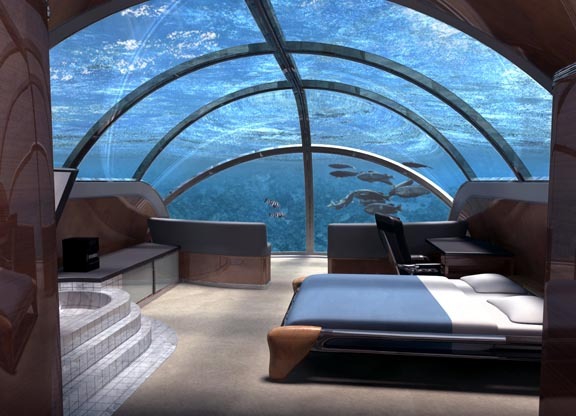 Although the hotel will have a fleet of small submarines, getting down to the luxury suites (rumoured to be priced at $15,000 per person per week) won’t actually mean getting in the water; the building will be connected to the surface by elevators and air shafts. Today, however, more people live in space than submerged in H20. More research dollars are spent on establishing habitats on the moon and Mars than underwater. “It is said that if we could handle the density of Manhattan, the whole population of North America could be placed in a state the size of Connecticut,” Hadfield tells visitors at the Ontario Science Centre. “On land we have randomly chosen where we live. 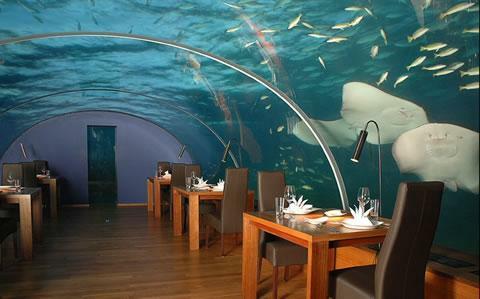 But in the water, there would have to be more order. 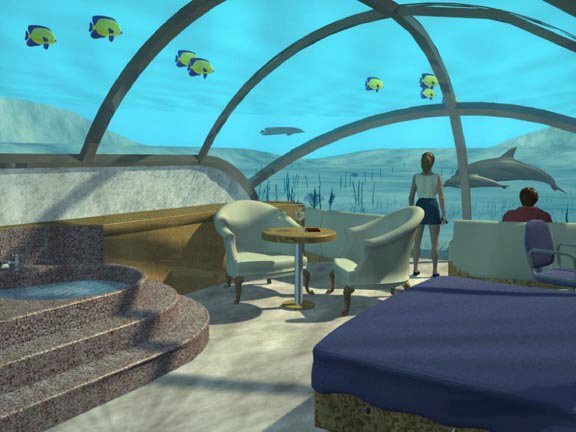 Living underwater, like living in space, has some challenges – breathable air, potable water, construction constraints and temperature – but there are advantages, too. Hadfield, like most other NASA astronauts, has spent time in the Aquarius permanent undersea laboratory, one of the world’s few underwater habitats, 20 metres down and five kilometres east of the Florida Keys. 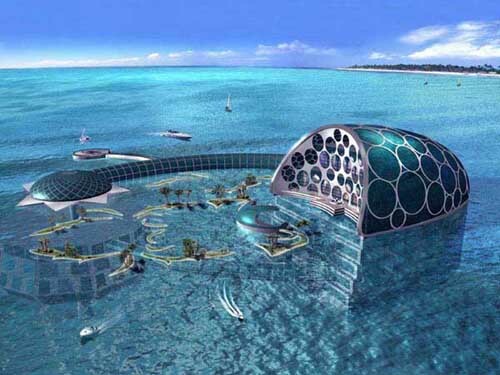 The submerged building is owned by the U.S. National Oceanic and Atmospheric Administration and used for a wide range of underwater research projects. 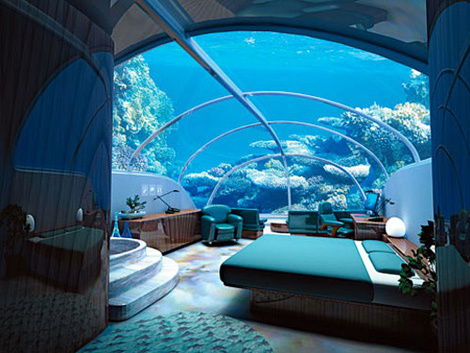 “People live under the water today for very short periods of time – usually a week or less, but sometimes for extended periods of up to two to three weeks,” says professional architect, author, explorer and former mission commander for seven NASA underwater missions, Dennis Chamberland (see chamberland.org). Chamberland’s Atlantica project will be using a donated submarine (originally built to hunt for the Loch Ness monster) to establish three manned undersea habitats over the next five years. If the construction of the underwater station goes as planned, people will begin living on the bottom beginning in 2012, Chamberland says. “Humankind is attracted to the beautiful and exotic places of our solar system. 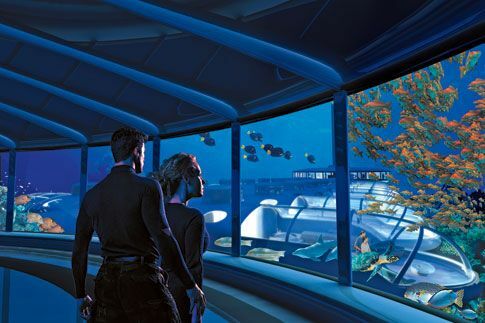 Just as man will be attracted to one day living on the cliff sides of the Valley of the Mariners on Mars, mankind will be attracted to live in the beauty of the underwater regions of our own planet,” he says. A decade ago a research project involving the Canadian Navy’s Cormorant dive tender found little life on the floor of Lake Ontario near Toronto’s Harbourfront area. But filling in sections of Lake Ontario, albeit in relatively small blocks, presents more political problems than ecological and construction roadblocks. Would interest in underwater construction persuade politicians to allow building in the same lake that provides Toronto’s drinking water? After emerging Godson was besieged with offers from the media to fund and film future extreme adventures. He was in Toronto earlier this summer to shoot a pilot TV show for Canada’s Cineflix Productions, which wants to make a 13-part series following Godson’s future projects. “My quarry project was done on a shoestring, but it shows that soon people can live underwater and it can be done cheaply,” Godson says. 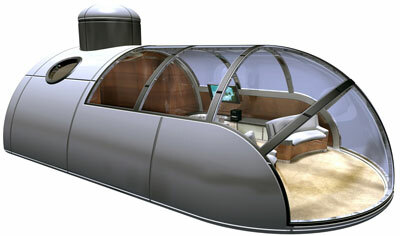 “My habitat wasn’t luxurious and there would have to be a lot of improvements to be usable again. I had a bed, a computer, a phone, email, plants and a fishing rod. I was doing all right, but mate, it was a bit boring. There are some excellent points made here. Normally, I’m not awfully fond of politics. but, sometimes all of us have to pause for thought. Interesting, thank you. I have recently been searching all about for this info. Happily I just came across it on Google. Hey I like your blog found you on google and its good to see that there are decent people out there providing good info. Pingback: About Citizen Scuba Diving Watch | Wolfs Article Den. I always enjoy reading such insightful posts by a person who is so obviously well-informed on their chosen subject. I’ll be following this blog with much interest. Keep up the good work and I look forward to seeing this site go from strength to strength!